AeroStay features air-conditioned accommodation in Sioux Falls. This 2-star hotel offers a 24-hour front desk. Free WiFi is included. At the hotel guests are welcome to take advantage of a fitness room. For guests' convenience AeroStay has a business centre. 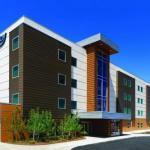 Sanford USD Medical Center is 5 km from the accommodation. The nearest airport is Joe Foss Field Airport 1 km from AeroStay.